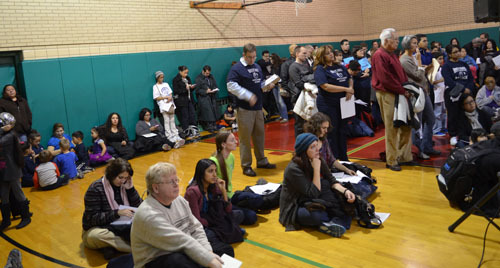 More than 500 parents, teachers and children from dozens of Chicago public schools squeezed into the Horner Park field house gymnasium on Friday night, December 14, 2012, for another hearing by the "Commission" on Chicago schools utilization plans. The hearing, scheduled to take place from 7:00 p.m. until 9:00 p.m., was the fourth in a series being held by the appointed Commission since the Illinois General Assembly approved a request form Chicago schools Chief Executive Officer Barbara Byrd Bennett that the system be allowed to ignore a state law requiring the announcement of a list of schools to be closed or otherwise shut down by December 1 of each year. A fifth hearing had been held at the University of Illinois at Chicago, but the public had not been allowed to participate in that one. Systems analyst and researcher, Jeanne Marie Olson, a north side parent now working with Raise Your Hand, tried to explain to the members of the Commission how their numbers were wrong, using charts that the group had prepared (above). Researchers are showing how CPS "underutilization" figures are dishonest, based on a misuse of the data available, and how the "overcrowding" figures were equally wrong. CPS has overestimated its underutilized schools and underestimated their overcrowded schools by using biased formulas, designed to present the talking points Barbara Byrd Bennet and Mayor Rahm Emanuel keep repeating to the press. Substance photo by George N. Schmidt. At the December 14 hearing, the Board of Education's Commission had provided seats for only about 200 people in the Horner Park gym. As a result, the majority of people were forced to stand along the walls or sit on the floor. More than 50 had signed up for the opportunity to speak for three minutes during the two hours allowed for the hearing, resulting in a large number of people being told they would not be permitted to speak as the officials wrapped up their hearing and left a nearly full gymnasium at a few minutes after 9:00 p.m. All those who had signed up to speak had waited patiently, despite the fact that they were being cut off rudely when a CPS official would bark "TIME!" no matter how important the issue was. The Commission members also provided the public with the minimum amount of information about the alleged situation in the schools. CPS has claimed, using a controversial formula (see below), that more than 100 schools are "underutilized" while a smaller number are "overcrowded." Parent and teacher researchers have debunked the CPS numbers, demonstrating that they are basically propaganda talking points designed to make a case that CPS has a huge number of "surplus seats" (the number presented to the public during the past six months has ranged from 200,000 to the current claim of around 100,000) and that the system will save massive amounts of money by closing schools and supposedly "right sizing" the district's property inventory (which CPS has been referring to, corporate style, as it's "portfolio" for the past two years). Despite claims by CPS officials and members of the Commission that the hearings of 2012 were unprecedented in their scope and were an example of CPS providing more information, by contrast with previous years at each successive event by the Commission it becomes clear that there is less actual information. In 2011, CPS held two major hearings on the proposed guidelines for school closings and other transformations at two high schools during the months of October and November. The 2011 hearings, at Westinghouse and Simeon high schools, enabled CPS officials to provide the public with Power Point versions of their guidelines and were held in venues where there were plenty of seats for everyone. After claiming this year that they want to "restore trust" in CPS actions, with each successive hearing the Commission is doing the opposite. Part of the crowd that ultimately totaled more than 500 people arriving in the Horner Park field house gym on Friday evening, December 14, 2012, for another hearing of the "Commission" appointed by CPS CEO Barbara Byrd Bennett on school utilization and closings. The Commission provided only 200 seats for the public and refused to explain why the hearings are deliberately being held in locations that are too small for the crowds that are coming to speak out against the looming closings. Instead of holding the hearings in nearby schools with large auditoriums and available sound and display systems (including for the north side hearing, Lane Technical High School, Lakeview High School, and Roosevelt High School, all of which were within two miles of the Horner Park site), the Commission members insist on making the hearings as inconvenient and uncomfortable as possible for those who want to speak out against the proposals. The Horner Park hearing was the second held on a Friday night (the first the previous week in Marquette Park on the South Side). Substance photo by George N. Schmidt.The "Commission" was established by the latest CPS "Chief Executive Officer," Barbara Byrd Bennett, after Chicago Public Schools successfully got the Illinois General Assembly to postpone the announcement of the 2012 - 2013 list of schools to be closed. Instead of providing the public with the list on December 1, as required under the Chicago Facilities Law passed two years ago, CPS now has until March 31 to compile the list for the public. As usual, the members of the Commission were unable or unwilling to answer questions -- although Commission Chairman Frank Clark regularly interrupted speakers with observations or comments (which reduced the amount of time members of the public had to present their comments to the commission). When the hearing was abruptly adjourned at 9:10 p.m. despite the fact that more than 250 people were still in the sweaty gymnasium and dozens still wanted to speak, there were cries of protest, but the members of the Commission left as quickly as possible, some escorted by security. CPS officials lurked around the perimeter of the room without identifying themselves. By the time the speakers began to testify, often interrupted by Frank Clark and always reminded that they were limited to three minutes by the bellowing TIME! from the Commission table, hundreds of people were bottled at the door of the gym, while children and adults were requited to stand along the walls or sit on the floor. The year before, during the hearings at Westinghouse and Simeon high schools on the 2012 school closing proposals, CPS officials held the hearings in school auditoriums, where there were always enough seats, decent acoustics, and overhead projectors for information. The Commission appointed by Barbara Byrd Bennett has deliberately scheduled its hearings at locations where the public faces maximum inconvenience, and where the Commission does not have the facilities to provide information on a big scree to those who bother to try and participate. Substance photo by George N. Schmidt.Several schools, including Brentano Elementary and Stockton Elementary, brought large numbers of people, including students, many of whom wore school tee shirts. Others, dozens in fact, were represented by teachers, parents, and other staff, including principals and assistant principals. CPS officials refused to provide a number or list of all those who were denied the right to speak, and Clark announced at the end of the meeting, as the members of the Commission were rushed out of the room (amid cries of "Don't Leave..." and "Hell No! We Won't Go!") that anyone who had prepared remarks could provide them to the Commission. But it was clear that anyone who tried to hand written remarks to the Commission was not being provided with someone to give them to, and the Commission website has not record of those who provided such information to the commission at previous hearings (although the technology is easily available). Administrators from a number of schools told the specifics of their problems: overcrowding caused by poor CPS planning decisions or underutilization for the same reasons. Because CPS built a new middle school (Aspira Haugan) and then gave the building to the Aspira charter schools (based on clout from Iris Martinez), Hibbard Elementary is overcrowded. At the same time, the construction of a new elementary school and the opening of an unwanted charter school have caused the "underutilization" of Northwest Middle School. Despite the inconvenience and discomfort, especially to the dozens of children who were there (some of whom testified), the crowd continued to grow until more than hallway through the hearing. A bottleneck was formed at the entrance to the gym, making it more difficult for those trying to get inside to squeeze through. CPS officials, who were more concerned with making certain that "TIME!" was called aggressively when each speaker was speaking, made no effort to add additional seats to the gym or to make it possible for people who wanted to get inside to get across the gym to the far side, where some floor space was available. Although a few people who spoke said that they understood the problems facing CPS (indicating that they had believed the mendacious talking points circulated about the CPS "deficit" and the claim of "underutilized seats" across the public schools), most of the speakers were well informed and did not believe that claims being made by the people seated at the main table. The members of the Commission, except for Frank Clark and State Senator Iris Martinez (whose work in Springfield enabled Rahm Emanuel to change the deadline for the publication of the Hit List), did not speak and rarely took notes during the event. Despite the fact that CPS has had a court reporter taking down the complete testimony of each speaker, the transcripts have not been published, either on the CPS website or on the Commission's special website. Adding insult to a number of injuries, a few days before the Horner Park hearing, CPS issued a press release announcing the deadline for parents to apply to get their children into the CPS selective enrollment schools. The deadline was the night of the Horner Park hearing, December 14, 2012! As usual, the announcement of the deadline quoted CEO Barbara Byrd Bennett, but CPS Communications officials refused to hold a press conference where members of the media could ask questions of the latest CEO (the fifth in five years) for the nation's third largest school system. (One year ago, Byrd Bennett was working to destroy the remaining public schools in Detroit, Michigan). Although each new hearing presents the public with new challenges in trying to communicate the massive frustration with and anger at the CPS approach to closings, one of the unique things about this year's activities is that CPS is at one level providing the public with much more information than last year. (Previous years are a mixed bag, since different approaches were taken in each year and there is virtually no complete record available at the CPS website, www.cps.edu and the records compiled by Substance, and currently being transferred to the Chicago Teachers Union research library, as incomplete). Members of the Raise Your Hand Coalition, a group of more than 6,000 parents, brought their research to the Commission in the form of hand-held panels, showing how the Commission's version of "underutilization" and "overcrowding" deliberately lied. "Underutilization" is based on overstating the issue, providing CPS officials and Rahm Enanuel with talking points that grossly exaggerate the problem. Meanwhile, the overcrowding, which is severe in the area where the December 14 hearing was held, is deliberately understated. Members of the Commission (seated at the table on the right) were silent when presented with the evidence of their own ignorance or mendacity. Substance photo by George N. Schmidt.This year, the Commission has established its own website: www.schoolutilization.com. As of December 16, 2012, the Commission has posted You Tube videos of some of the hearings and, inexplicably, the testimony of two of the more than 100 people who have spoken before the commission (Barbara Radner and Robert Starks). Although there are many reasons to be critical of the Commission, the availability of this material is unique, since CPS has virtually wiped out the majority of documents about closings (since 2004, under "Renaissance 2010") and various other adverse school actions ("Reconstitutions" which began in 1997). The Commission also doesn't explain why the website doesn't also include the transcript of each of the hearings, since the CPS stenographer is taking notes throughout the hearings and the transcripts could easily be completed by the following day. The Commission members have also refused to admit that there is and has been a direct relationship between charter school openings and school closings (not only for "underutilization," but for academic reasons) since the early 2000s. Dozens of CPS schools, most of which were expensively rehabbed during the years prior to their closings as real public schools, are now being leaded (at one dollar per year) to charter schools. These range from the old South Chicago Elementary School on the city's far Southeast Side to the Collins High School building on the near West Side. A complete listing of all charter schools currently leasing CPS buildings is being compiled by the CTU researchers, but the record of the cost of rehabilitation of the buildings prior to their being "flipped" to the charters is incomplete. The reason why the original legislation had set the December 1 deadline was that legislators and others supporting the facilities plans wanted parents to know before the deadline for applications that their schools were facing possible closings. Chicago Public Schools (CPS) reminds families that the application process for the 2013-2014 school year will close on Friday, December 14. This process allows families to apply for the District's elementary magnet and selective enrollment schools, and high school offerings including magnet, selective enrollment, International Baccalaureate (IB), military academies and career and technical education programs. "As the application deadline is quickly approaching, I urge those families who have yet to make decisions to explore their academic options and get those applications in," said CPS CEO Barbara Byrd-Bennett. "CPS provides many high quality school options, and we have provided easy-to-use resources to help families find just the right school to meet the academic needs of their students." All applications must be submitted online at www.apply.cps.edu, or in-person at CPS Downtown headquarters located at 125 S. Clark Street no later than 5 p.m. on December 14. CPS will not accept any applications that are post-marked after December 14. Families that intend to apply online must already have applied for a PIN in order to complete their online applications. Otherwise, paper applications must be submitted and can be downloaded from www.cpsoae.org. The CPS Office of Access and Enrollment (OAE) website at www.cpsoae.org General information about CPS schools and academic programs is available here. Families can find more detailed information under the Resources tab regarding the application process and selection and notification processes. New online videos that providing helpful information regarding the application process. The elementary school version can be viewed here, while the high school version can be viewed here. Tier Data Tier data is available via the OAE website. Families applying to selective enrollment and magnet schools can visit the website to determine their respective tiers based on their home address, which can help parents make informed decisions on what schools and programs their children may be most eligible for. Comprehensive Resource Guides of School Options The District's Options for Knowledge elementary school guide and the all-new searchable High School Directory provide comprehensive listings of CPS academic programs. Both guides are available online, and print versions are available at all schools and CPS downtown headquarters located at 125 S. Clark Street. Both the Options for Knowledge Guide and the High School Guide are available in English and Spanish. Additionally, school guidance counselors are available for help making informed decision based on the academic strengths of their child. Parents also can contact OAE at 773-553-2060 for guidance related to the applications process. It's admirable that dedicated parents, teachers and students alike are participating to bring forth the truth in such a well-resourced manner. And the more informed the rest of the taxpaying citizens of this city are about what sort of shenanigans the CPS pulls, the better. Safe Schools & the Elimination of Drug Lord's & Moffia. I am writing to voice my concern about the R.J. Daily, Hinshaw, Leo J. Athas, Cynthia Gotha, now known as Cynthia Hansen, and all of the corrupt Real Estate Companies as well as the Chicago Tribune, Sun-Times, etc. degrading Elite Black Teachers and using their money to build all white communites throughout America and Africa. I just pray that Blacks/Whites do not carry this garbage into the U.S.S.R. Please do not protest when you have not learned to respect your own, and to love one another.